M17, or the Swan nebula. 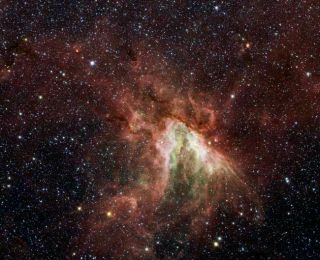 NASA'sSpitzer Space Telescope has captured a new, infrared view of the choppystar-making cloud called M17, or the Swan nebula. The cloud,located about 6,000 light-years away in the constellation Sagittarius, isdominated by a central group of massive stars — the most massive stars in theregion. These central stars give off intense flows of expanding gas, which rushlike rivers against dense piles of material, carving out the deep pocket atcenter of the picture. Winds fromthe region's other massive stars push back against these oncoming rivers,creating bow shocks like those that pile up in front of speeding boats. Three ofthese bow shocks are nestled in the upper left side of the central cavity, butare difficult to spot in this view. They are composed of compressed gas inaddition to dust that glows at infrared wavelengths Spitzer can see. Thesmiley-shaped bow shocks curve away from the stellar winds of the centralmassive stars. In theimage, dust is red, hot gas is green and white is where gas and dustintermingle. Foreground and background stars appear scattered through theimage.